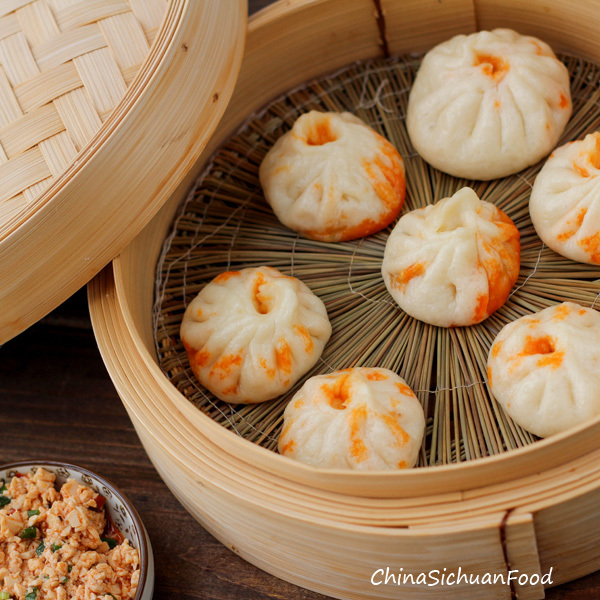 Baozi is also known as Chinese Steamed filled buns. In China, it has the same position with dumplings. 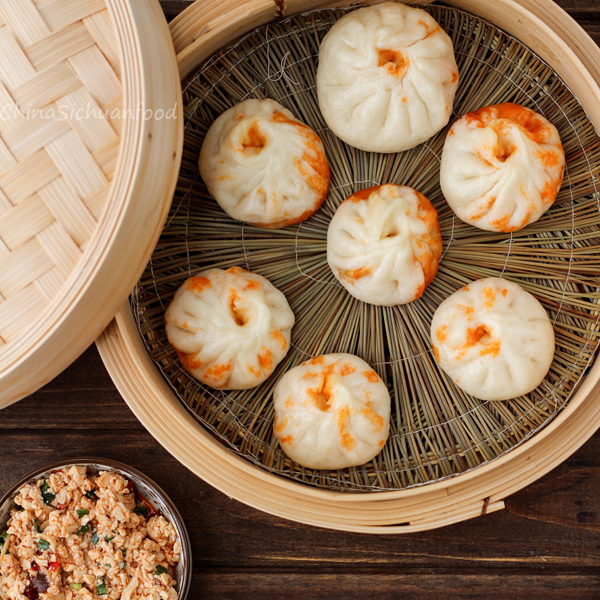 The difference between baozi (包子)and dumplings（饺子）lies in the final shape and the dough. Usually the dough for dumplings does not use yeast while most of the dough for baozi needs yeast. 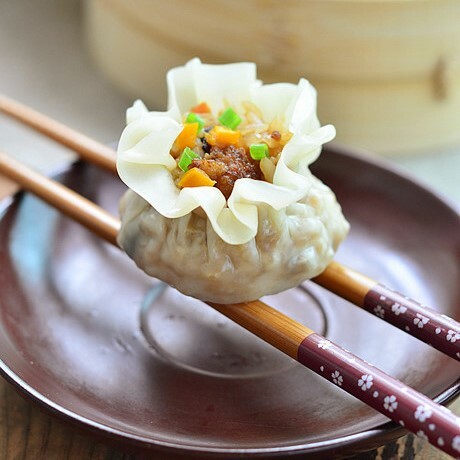 However soup dumplings is a member of baozi in China with the name of 灌汤包. 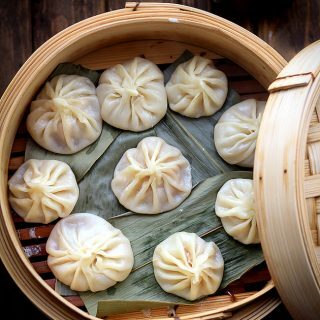 Besides, baozi is usually around while dumplings are of different shapes. 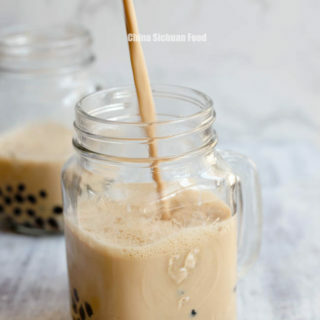 I have write a general post introducing Chinese baozi. Making the dough for baozi is similar with the dough for mantou (馒头), meat baozi usually is called Chinese steamed pork buns. However a little bit more water is added compared with the dough for making Chinese Mantou. 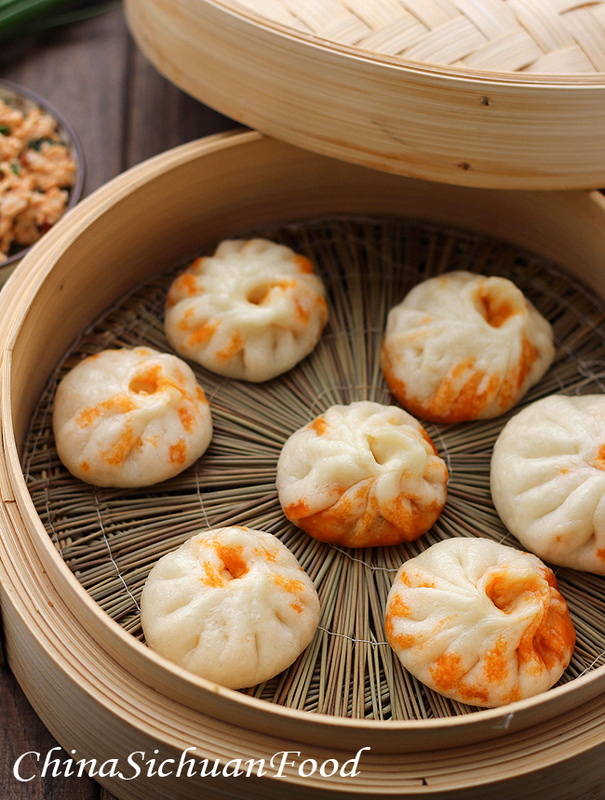 For the details about making the dough, check Chinese steamed buns. Scatter some flour on your board and cut the log to small sections around 1 inch long. Roll the small dough into round wrapper with thinner edges. Another part for making baozi at home is to fold baozi. The process is quite simple and contains the following steps. Prepare the wrapper and the filling. Place the wrapper in your left hand. Place 1 ~2 tablespoon of the filling in the center of your wrapper (depending on the size of the wrapper). Fix the starting point with the thumb of right hand and begin to fold the edge counterclockwise. Move the thumb slowly in the process until the boazi is completely sealed. 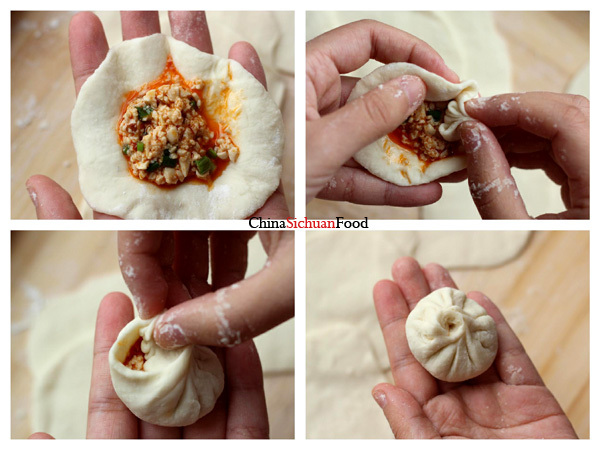 For more pictures about how to fold baozi, check here. The filling used for today’s vegan baozi is stir-fried tofu with the similar taste of mapo tofu. I love it so much! Vegan Baozi with tofu as filling, similar taste to mapo tofu. Prepare warm water around 35 °C. And mix the yeast with the water. Mix well and set aside for around 5 minutes. If you do not want sugar, just skip it. Prepare the flour in a large bowl. Pour the water with yeast slowly to the bowl with flour and stir with a chop sticker. Then knead the flour into smooth and soft dough. At the very beginning, it might be a little bit sticky. Cover the bowl and let the dough rest for around 1 hour or until the paste ball doubles in size. This process can be done by mixer. When the dough is double in size, get paste ball out and punch the air out. 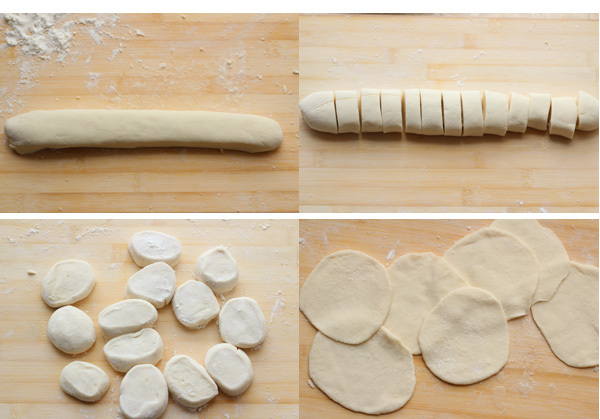 Then roll the dough into a long log around 1 inch in diameter or any size you want. Heat up cooking oil in pan. Stir fry ginger, garlic and doubanjiang firstly until you can sell the aroma. 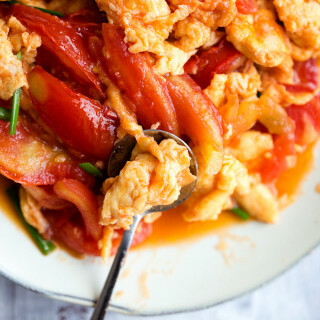 Add scrambled tofu in with salt and light soy sauce. Mix well. Remove the pan from the fire and mix chopped spring onions in. Then we have the fillings. Fold the boazi one by one like the picture shows. 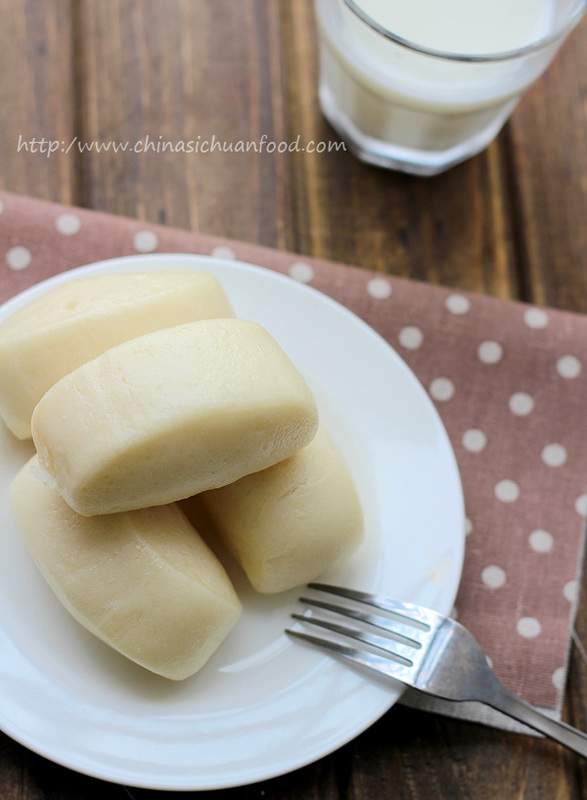 Brush some oil on the bottom of each baozi and put into the steamer. Heat up water in wok and begin to steam. Count at least 15 minutes after the water in wok begins to boil. Since the dough needs to be fermented for around 45 minutes, filling can be down during the process. When lift the cover of the steamer, please be quick and do not let any water drop on the surface of the baozi. Love Boazi, buns or dumplings, check the following recipes too. Pot Stickers Happying Eating and Cooking. Wow….. looking so great. I just want this. Great job. Thanks Yead for stopping by and lovely comment. I just found this blog and I’m in love! Awesome job!! Thanks Rika, I am glad you like it. I have always love Sichuan food, and your pics have certainly made them ever more tempting…. and true to form that they are very authentic. great site, will visit again. Thanks for your commenting. And I am really glad that you like it too. Thank you for getting back to me so soon, Though the recipes you offered I am sure are yummy they will not work for me as I am a vegan. 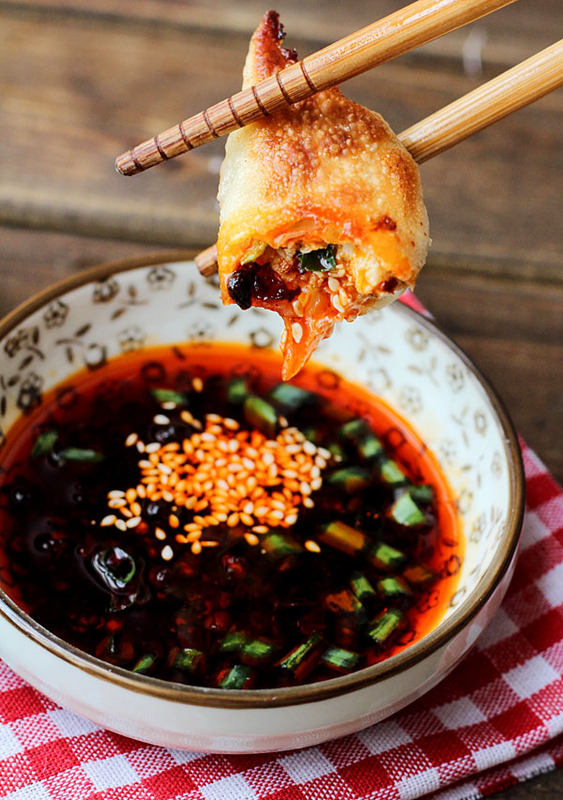 I will try to find the doubanjiang as your posted recipe looks great and I use to love dumplings. 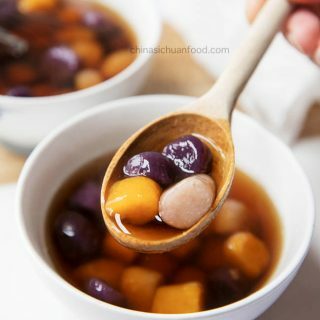 In this case, you can use it with eggplants or tofu, since we do not want any waste on food. From my personal experience, it goes really well with eggplants, green beans and tofu. 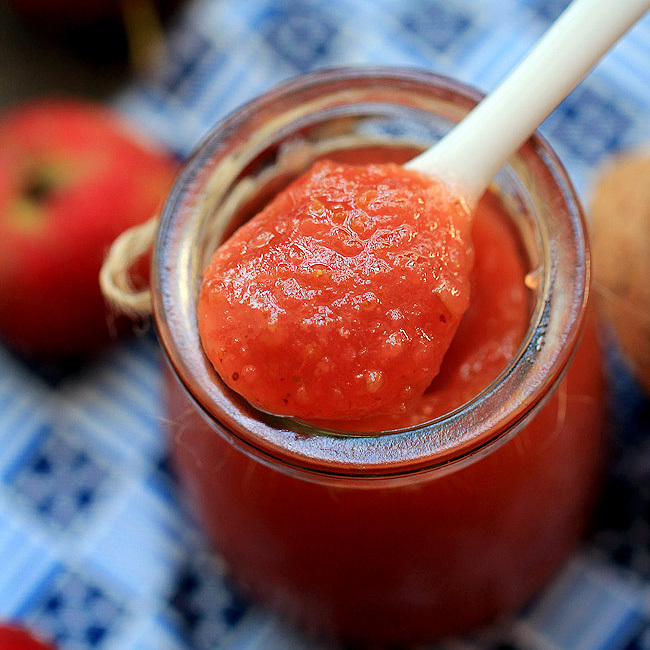 I have the ingredients ready to make this! Very excited… Is there any way the dough or buns can be preserved? Looking forward to more vegetarian friendly Sichuan meals! You can freeze the buns and then re-steam before serving. Thanks for trying my recipe and happy cooking ahead. 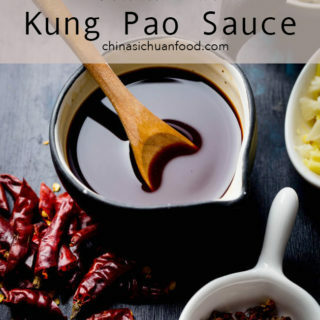 Such a great collection of instructions to make delicious Chinese food! I’m hosting a Chinese new year party soon and I’m planning to use a lot of your recipes. First time making Chinese food. I can’t wait to get started! 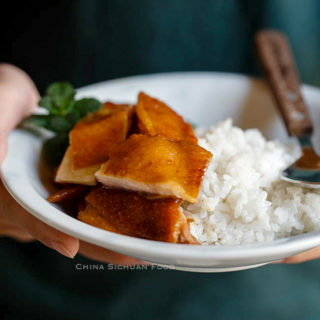 If you add about 2 tbsp of rice flour (or cornstarch) to the soy sauce and add it to the tofu filling it will cause the filling to seize up. Makes the filling stick together; causing construction and portioning to be a bit easier. after I roll the log, you say i should scater some flour on the boeard, is that ontop of the log? or is it to prevent thelog from stiking to theboard?? 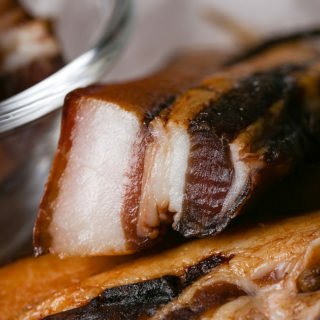 When I was in Nanning I bought 3 everyday for Breakfast, I love the Pork filled !! I miss The Chinese people and all my friends there !! Thanks John for leaving me such a kind comment. Thank you for this wonderful website and very helpful and clear videos. I am glad to helpful. You are the most welcome! My dought didnt raise what have I possibly done wrong? There are several reasons causing the dough fail to raise. 1. The yeast is not working – losing its power or killed by hot water. 2. The room temperature is too low and time is not enough.